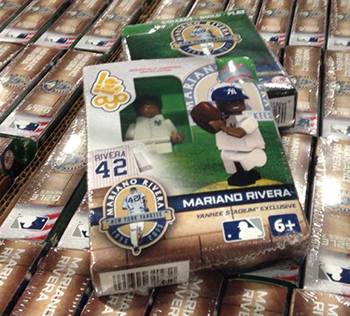 Mariano Rivera is getting a farewell gift from OYO Sportstoys. The company has made a special edition minifigure of the retiring pitcher. Available exclusively (at least originally) at Yankee Stadium, the Mariano Rivera Retirement OYO minifig is limited to 300 pieces. He comes in a pinstripe jersey. The Yankee Stadium exclusive version has a small note on the front of the packaging under Rivera's name. There's also a more common retirement figure that doesn't say "Yankee Stadium Exclusive." The regular, non-retirement Rivera OYO has him wearing a dark jersey. The limited edition minifig also has special packaging that includes the Mariano Rivera retirement logo. The final regular season home game of Rivera's career is on Thursday, September 26 as the Yankees take on the Tampa Bay Rays. OYOs are compatible with LEGO sets and other comparable building toys. Fully licensed, each MLB player comes in their team's uniform.